Its funny thing to cook the pop corns. becourse, Its make a pop sound in our cooking pan. Do you ever thought how corns make that sound. French physicists Emmanuel Virot and Alexandre Ponomarenko from the École Polytechnique have solved that popcorn pops Mystery. The popcorn kernels have some water and starch. So, water and starch play major role of this story. The researchers put some microwavable popcorn on a hot plate and ramped up the temperature in increments. Then, they used the video camera to capture the kernels’ motion. Although just 34 percent of the kernels popped 170 degrees Celsius, about 96 percent popped when temperatures got just a little higher, to 180 C. To understand why that was the case, the team measured the ultimate strength of the outer hull of the popcorn, as well as the radius of the kernel before and after its explosion. By combining these measurements in a simple mathematical equation, they calculated the pressure the kernel could withstand before popping. According to the researchers When the popcorn temperature exceeds 100°C, its water content boils and reaches a thermodynamic equilibrium at the vapour pressure, as in a pressure cooker. At the same time in the popcorn endosperm, the starch granules expand adiabatically and form a spongy flake of various shapes. Then, the popcorn jumps a few millimetres high to several centimetres high and a characteristic ‘pop’ sound is emitted. The first, each kernel of corn contains a combination of water and starch – the best kernels have between 13 and 14.5 percent moisture. When the kernel is heated up, the water is converted to super-hot steam, which liquifies the starch. The liquid starch has broken through the hull and changed into a solid – all in the course of a few hundredths of a second. While These solidifying process its make ‘starch leg’ to propel itself from the ground, just like a human gymnast. Next, The team investigated, why popcorn makes a popping noise. By looking at the footage and using a microphone to capture the pops, the team found that the pop sounds didn’t happen when the hull first split. Instead, the pop seemed to occur when water vapor inside the kernel was released, creating empty cavities inside the popcorn kernel that resonated once the pressure dropped. Similar phenomena occur when volcanoes or champagne corks pop. 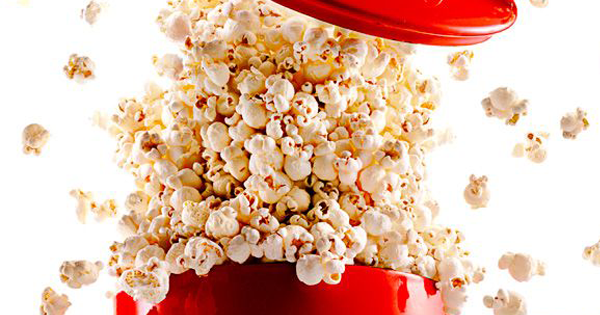 So, the thermodynamics equilibriums in nature do the “pop” of popcorn….